For the construction industry to keep up with the rapid evolution in technology trends, owners and employers need to instill a culture of innovation within their companies, say experts. Read more. 3D printing appears to be the “next big thing” in construction, rivalling BIM in its capacity to grab headlines. Beyond the headlines, 3D printing does provide great potential to fundamentally change the construction industry by altering the design, fabrication and installation processes. However, such radically new methods of working bring risks of liability and contractual issues. Read more. Regardless of the current market conditions, skilled labour is vital to propelling the economy forward. Many believe that despite the present challenges, keeping one’s eyes fixed on the future requires investments in training — particularly in the skilled trades. “Looking at the big picture, we expect the trades will remain an excellent career choice, since employers will need highly skilled workers as the economy rebounds and there are still industries where labour challenges persist,” says Paul Oss, public affairs officer with Alberta Innovation and Advanced Education. Read more. Over the past several months, the Department of Labour and Advanced Education has been consulting with the public to consolidate and amend the Workplace Health & Safety Regulations. Since the consultation launched in September 2014, LAE has received considerable feedback and has decided to completely re-think what regulatory changes are needed at this time. To read the full update, click here: WHSRs – Update Letter. Employment and Social Development Canada has launched the Flexibility and Innovation in Apprenticeship Technical Training (FIATT) Call for Proposal (CFP). Applications must be submitted by e-mail no later than March 3, 2015 before 11:59 p.m. EST. Applications received after this deadline will be disqualified. For the purpose of this CFP, it is expected that project activities will start after May 1, 2015, and have a maximum duration of three years. Innovative approaches can include, but are not limited to: e-learning; distance education; videoconference; correspondence; blended learning (combination of e-learning with classroom teaching); mobile facilities; and simulation technology. Click here for details about FIATT and how to apply for funding. Health Canada is changing the Federal WHMIS legislation to bring it in line with the Globally Harmonized System (GHS). An international team of hazard communication experts developed GHS with the goal of having the same set of rules for classifying hazards, and the same format and content for labels and safety data sheets adopted and used around the world. Currently many different countries have different systems for classification and labeling of chemical products. This situation has been expensive for governments to regulate and enforce, costly for companies who have to comply with many different systems, and confusing for workers who need to understand the hazards of a chemical in order to work safely. In Canada, the current roles and responsibilities for suppliers, employers and workers likely will not change in WHMIS after GHS. However, employers will need to update their education and training of workers to include the new format of labels and data sheets. Products with new Data Sheets and Hazard Symbols may start appearing on construction sites as early as Spring 2015. A new e-course entitled “WHMIS (After GHS) for Workers“, hosted by the CCOHS. Please see the CCOHS news release (http://www.ccohs.ca/newsroom/news_releases/GHS_29September2014.html) for information about the course and how people/organizations can register. Click HERE for a summary of the specification changes for 2015. NS Depart. of Labour and Advanced Education (LAE) is in the process of changing 13 of the OH&S regulations and these changes establish Workplace Health and Safety Regulations. 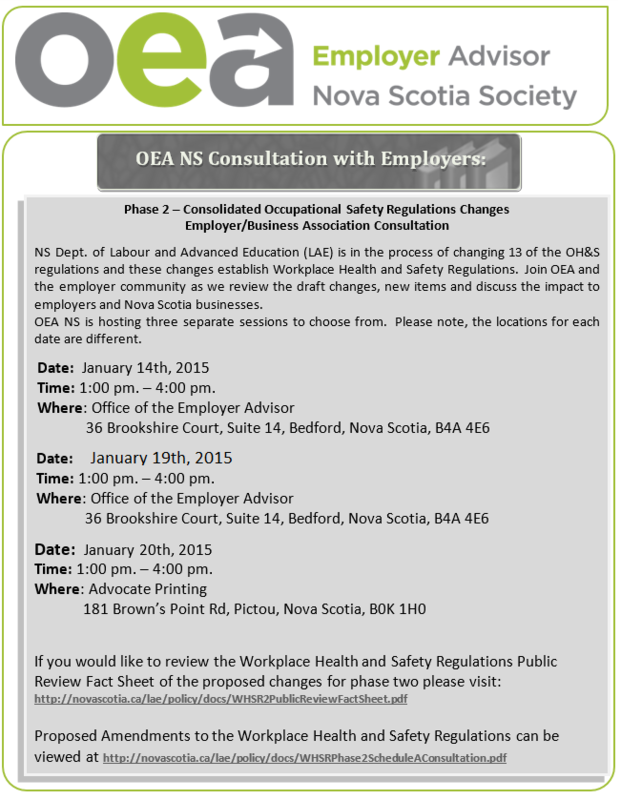 Join OEA and the employer community as they review the draft changes, new items and discuss the impact to employers and Nova Scotia businesses. Please click the following link: HERE and complete the registration fields below the posting. You will recieve a confirmation e-mail within 24 hours. If you have any questions, please contact Robert Benoit at robert.benoit@oeans.ca or 902-442-9367.